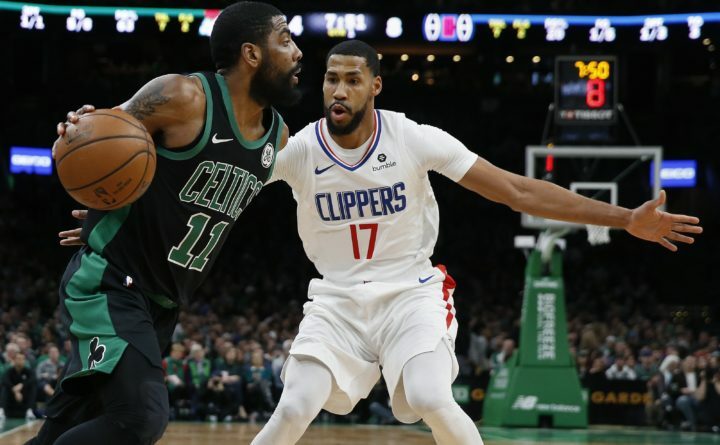 Boston Celtics' Kyrie Irving (11) drives past Los Angeles Clippers' Garrett Temple (17) during the first half of an NBA basketball game in Boston on Saturday. Clippers: Monday’s game against the Timberwolves completes a six-game trip, during which the team will have traveled approximately 6,659 miles — the fifth-most in the league this season, according to travelmath.com. They improved to 3-2 on the trip. … The 42 points in the fourth quarter tied a season-high for any quarter. Celtics: Fell to 22-8 at home. The Celtics went 25 for 31 from the free throw line, snapping a streak of two straight games without missing a foul shot. … They shot 4 for 22 from the floor in the third quarter.